The White House might be open to letting a Democratic response go public that counters the GOP FBI memo. In response to that controversial GOP memo on FBI surveillance, the House Democrats prepared their own memo, and the Trump administration just hinted at allowing its release. Rep. Adam Schiff, who's been a strident critic of the Republican memo, put the Democrats response together. It reportedly argues the Republican memo — spearheaded by Rep. Devin Nunes — is an attempt to help the White House with the Russia investigation. CNN reports it also says the FBI followed the right protocol to get FISA warrants during the 2016 election cycle. The Republican memo became public Friday with the president's support. Now, the White House seems open to the Democratic memo's release, too. It said Friday, "The Administration stands ready to work with Congress to accommodate oversight requests consistent with applicable standards, including the need to protect intelligence sources and methods." 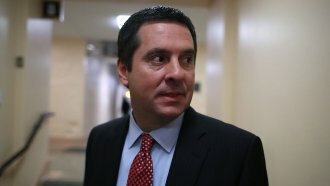 The House intelligence committee would have to vote to release the second memo. It already voted against its release once.